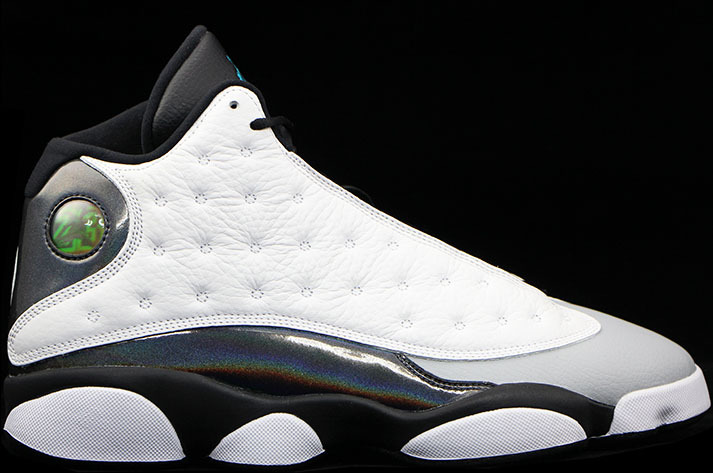 The Air Jordan 13 "Barons" features a mostly leather upper consisting of black, grey and white with blue accents. A grey tumbled leather is applied upon the shoes toe box and a white tumbled leather is applied across the upper side panel. Lastly a patent leather holographic panel is applied across the side and extends towards the back of the shoe. A blue jumpman jordan is present atop a black tongue. A black/white midsole and black outsole top it off for this Air Jordan 13 "Barons" color way.